Hello crafty folks! 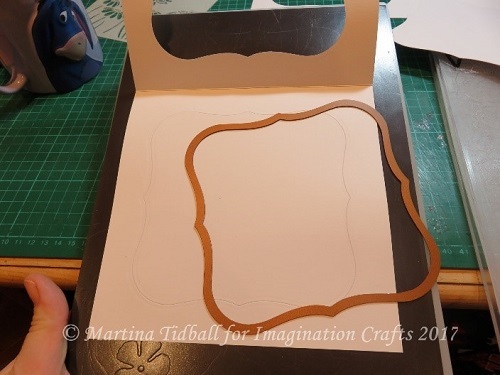 My name is Martina Tidball and I am so excited to have joined the Imagination Crafts' DT! 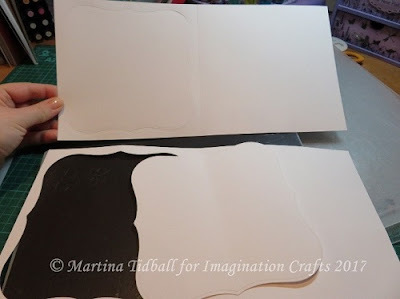 I would like to share with you a card I made for the Imagination Crafts' shows on Hochanda on January 22, not necessarily with a mixed media focus, but showing how the stencils and products can be used for all different styles, depending upon your crafty mood at the time! 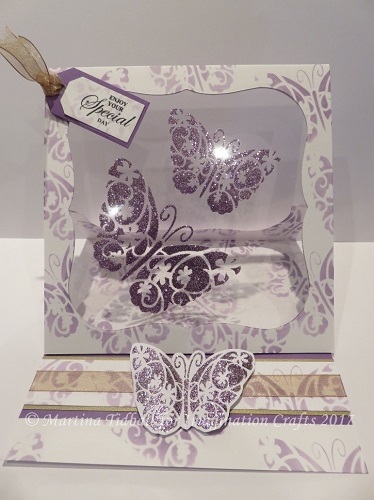 The first card is kinetic and features Lavender and Champagne Sparkle Medium with the beautiful Flutterby stencil. I took two identical 7x7 card blanks (strong ones!) 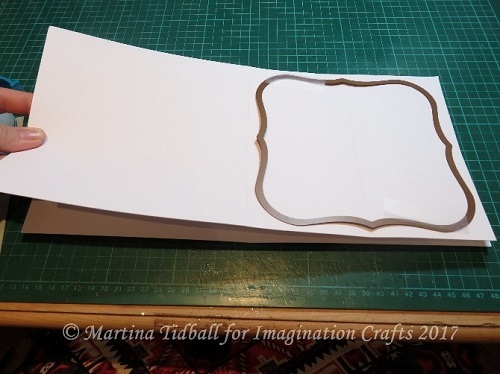 and on one, folded one side in half again and creased with a bone folder. 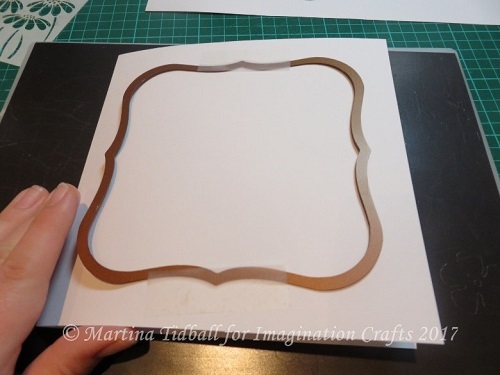 To make lining up easier, I chose a die that gave me a clear centre point. I secured this in the middle of one side of the card blank using my newly created score line. 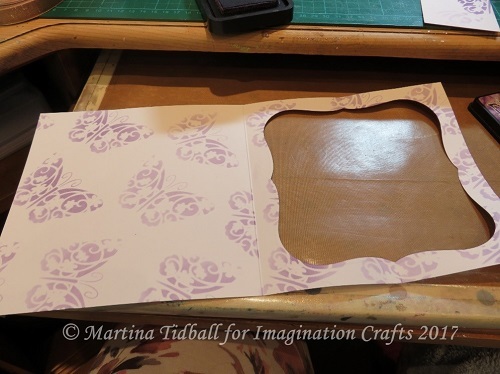 Once I was happy with the position, I took the other card blank (without the extra score line) and lined this up perfectly underneath ready to start die-cutting. 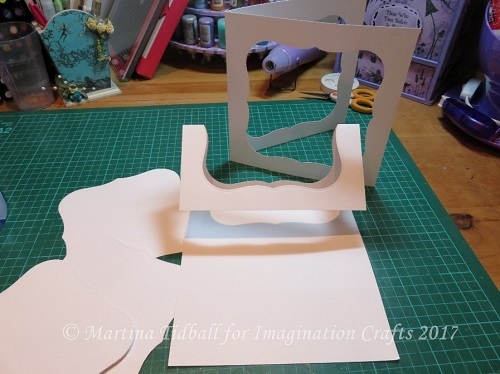 Once this combination was run through the machine, the top card had the shape cut out, and in the bottom card, the shape was only. This was important, as I wanted to ensure that all the panels aligned later on. 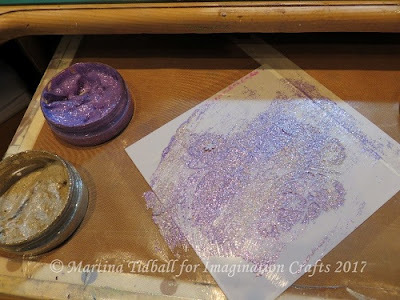 Wanting to create a stopper for my easel card, I used my stencil again and placed onto some strong card (one of the waste bits from earlier!) 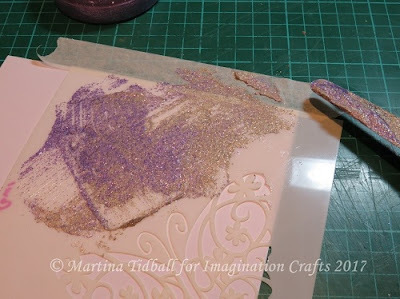 Using my ‘mixed’ Sparkle Medium to spread through the stencil, I made another butterfly and set aside to dry. Next, I created some interest on my card base. Cleaning and drying the same Flutterbye Stencil, I used some Dusty Concord Distress Ink to randomly place butterflies all over the frame and card (front and back). Some ribbon and a sentiment to finish it all off and there we have it! 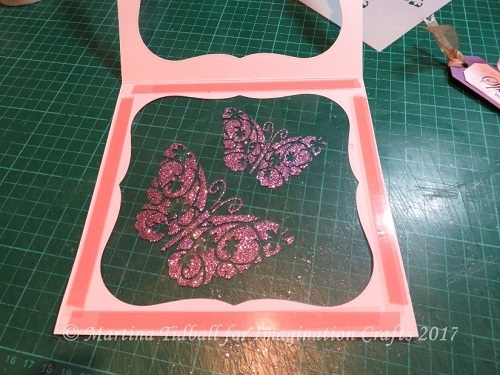 Once you have mastered the ‘frame making’ part, this card style can be used to showcase any of your stencils with Sparkle Medium! 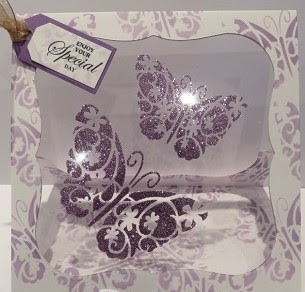 As the glitter is in a gel, it's flexible and looks beautiful from the front and back…perfick! Thank you for reading my first post, I look forward to seeing all your versions!